Stickers are a form of marketing material that in my opinion, are not utilized enough by most businesses out there. A lot of the time, businesses will choose more traditional marketing materials such as flyers or leaflets over stickers and while these are also fantastic alternatives that will be sure to generate a significant return on investment in most cases, I personally have a love for stickers and believe that businesses need to make more use of them. The thing with stickers is that people love them. When you post a flyer through someone’s letterbox, it will get thrown away in many cases and thus, your marketing effort is rendered somewhat pointless. However, when it comes to stickers, people will often utilize them and stick them on their personal possessions, which is great for brand awareness. A lot of the time, companies that utilize stickers in their marketing campaigns be surprised as to where their stickers actually end up being placed. However, as with any other form of marketing, it’s important that your stickers actually catch people’s eyes in the first place if they’re to have any hope of creating the brand awareness that you desire. So, to inspire you, here’s a list of a few of my personal favorite sticker designs that are all extremely eye-catching. 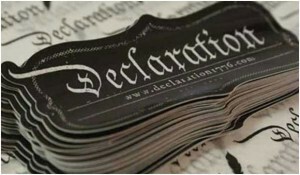 Declaration is a cool, trendy and well-branded apparel company specializing in t-shirts that are made in the USA and are based on American history. So, they have a pretty unique selling point as you can see, but being as there are a lot of other apparel companies around (many of which have huge marketing budgets to spend), Declaration opted for utilizing a sticker design in order to increase brand awareness for the company. As you can see from the finished design above, it’s an extremely bold looking sticker that is sure to raise brand awareness. It’s also a really cool-looking sticker that oozes attitude as well as quality (and also an essence of luxury too I feel). The sticker is simple and it basically just features the logo and name of the company, along with the website address. However, the sticker is so well-designed and reflects the brand so well that it will no doubt get utilized by any of the brands loyal fans. If you think about it, fans of the brand are extremely likely to stick these to their personal possessions and clearly, this will quickly generate a buzz around the brand and increase brand awareness. The stickers are also uniquely shaped which furthers increases their eye-catching ability. Orange Information Systems Group is a relatively small company in the UK that specializes in IT-related services. Obviously, IT is quite a saturated market at the moment and it doesn’t matter what part of the IT business you’re in, you can guarantee that you have a fair few competitors to deal with. Clearly, this calls for a creative form of marketing and in the case of Orange Information Systems, it came in the form of a fantastic, bold and minimalistic sticker. As you can see from the sticker (pictured above), the stickers are very simple in their design and once again, they feature the company name and the website address; that’s all. Truthfully, this is all the sticker needs as the bold use of contrasting colors (black and orange) are really what make the stickers stand out. I’m sure that no matter where these stickers end up being placed, they will grab the attention of any passers-by and increase brand awareness hugely. 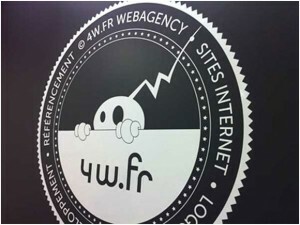 4W.FR is a web agency based in France and unlike the two stickers that I’ve mentioned previously on this inspirational list, this sticker is actually a larger design that has been created for a slightly different use. 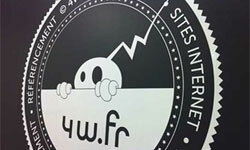 Basically, this sticker was created with the intention of being stuck on the wall at the web agency and therefore, it was a fairly large sticker. Despite this, it still makes it to our list as it’s a fantastically well-designed and bold sticker that will no doubt serve as an attention-grabbing piece for any clients lucky enough to work with the web agency. Once again, it’s quite a minimalistic sticker design that is comprised of only two, quite monotone colors. The result is a clean looking sticker that features the company name/web address along with some of the services they offer. It also features the companies, slightly Android-like mascot/logo. 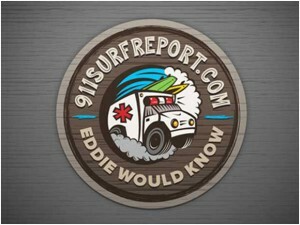 911SurfReport.com does exactly what it says on the tin; it offers surf reports from around the world. Once again, the website decided to utilize stickers in their marketing campaign to raise awareness for the website. As you can see from the sticker design (pictured above), it’s a really cool-looking sticker that has a really fun, cartoon-like design to it. It features the websites URL along with their slogan “Eddie Would Know”. It also features a cartoon Ambulance (this reflects the 911 in the website name). The result is a clean and bold sticker design that is sure to catch the attention of its target audience (i.e. surfers). Stickers are a fantastic marketing option for such a website as you have to remember, all surfers have surf boards; the perfect surface on which to stick a cool looking sticker. If you’re willing to put a bit of effort in to the design aspect of your sticker and ensure that it’s bold and eye-catching, stickers can be a fantastic way to raise brand awareness for your business. There are a lot of different alternatives out there for stickers too. You can shape them any way you like, size them any way you like and so forth. Like any other form of marketing material, the only limit is your creativity. Joshua works in the marketing department for the UK-based sticker printing company; (Discount Banner Printing). They specialize in the printing and design of self-adhesive stickers and labels.